Yesterday, my friend Claudia gave me some fresh, green peppers of the pointy variety (like large chillis). We don’t have a special word for these in the UK. We had the peppers barbecued last night while sitting in her garden, under a huge walnut tree, in idyllic surroundings, yet right in the centre of Berlin. 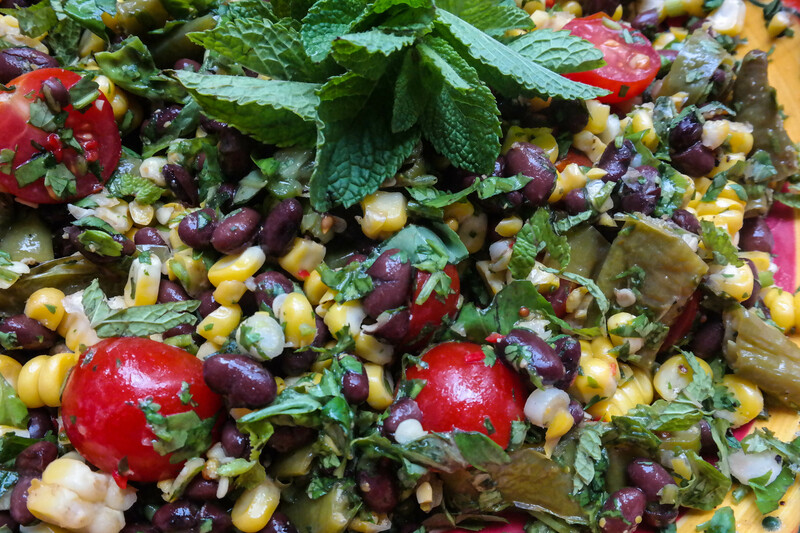 I already had some fresh corn in the fridge as well as the coriander and a tin of black beans in the cupboard so it was easy to throw this together. This is a complete meal but would also go well inside a tortilla with some guacamole or pumpkin hummus. You could also add fried slices of tofu or toasted peanuts for a crunch. cobs and place in a large bowl. Chop the peppers roughly and add to the corn with the beans, tomatoes and onions. Stir in 2 handfuls of the mixed, fresh herbs and drizzle over the dressing. Add the chilli and stir well. Season to taste. Place in the fridge to chill for about 30 minutes. I got the idea for this when I was in Italy, last summer, on a yoga retreat near Rome, in a place called In Sabine. The villa had a huge vegetable garden and all of the food was sourced from there. I used to go and watch the gardener making the harvest each morning and wonder what we would be eating for lunch. The food was fresh, traditional and delicious. They also had a couple of fig trees and one of the other guests Uma and I used to love finding the fresh figs, just coming into season, and eat them on the way go the yoga platform. If you have not eaten fennel before, it has a subtle aniseed flavour and is crunchy and light -ideal for a salad. 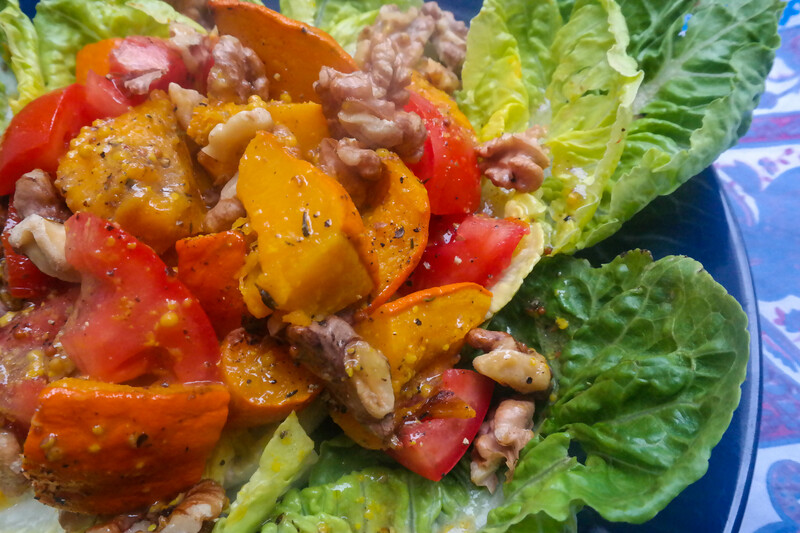 A tablespoon of balsamic dressing. I make my own with 3 parts extra virgin olive oil to 1 part balsamic vinegar then add Dijon mustard and agave syrup. I keep a bottle in the fridge. You just need to combine all of the ingredients in a bowl. 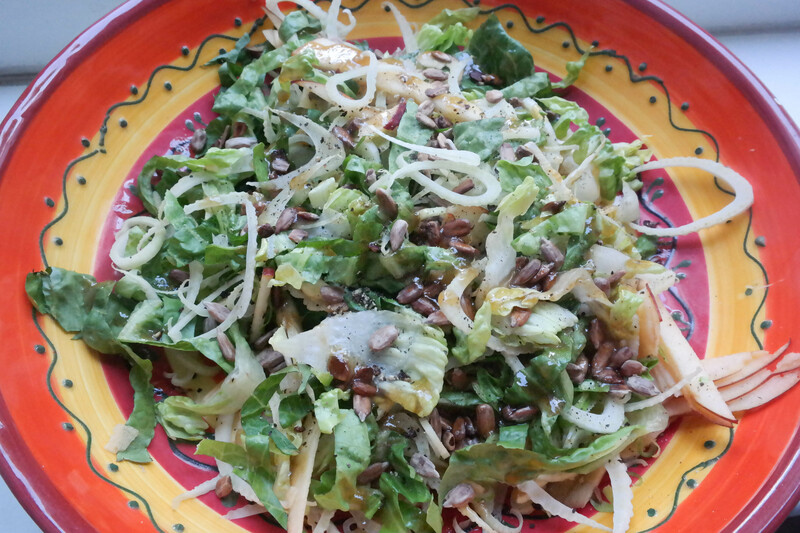 Don’t overdress the salad, use your discretion with the amount of dressing but keep the salad light and crunchy. Dress at the last minute. Probably the best vegan dish ever is Som Tam Jay. 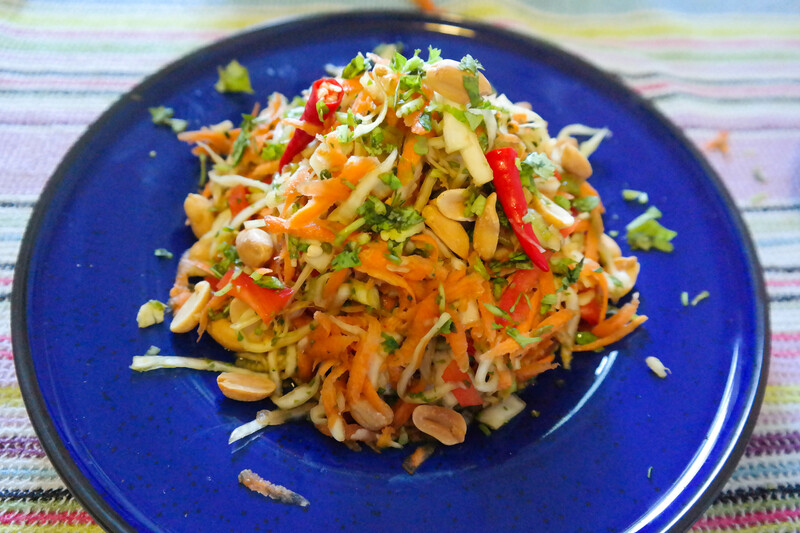 This is a veggie version of the papaya salad that is eaten all over Thailand but originates in Isaan in the North-East. I make many versions of this with whatever is to hand. Everything works as long as it is raw and crunchy. There also need to be toasted nuts. Be experimental and see what works. This is a raw dish and super healthy. Add the curry paste to the liquid ingredients and add a sprinkling of sugar until the balance tastes right. Add the dry ingredients to a bowl and pour over the dressing. Keep tasting and adjusting until it tastes right to you. It should be sour, salty, sweet and spicy with no single flavour dominating.